A leading organizer of consumer motorsport trade shows, International Motorcycle Shows executes annual events to promote the latest motorcycle, watercraft, and all-terrain vehicles. The shows provide clients with a seven-month advertising and marketing campaign reaching millions of consumers through TV, radio, outdoor billboards, print, online ads, email blasts, direct mail, social media, grassroots outreach and targeted public and media relations. International Motorcycle Shows wanted to effectively promote its nationwide event with edgy communications materials while maintaining equal representation of the industry brands participating in the show. In addition, product manufacturers wanted to use their own photography, which they felt best represented the featured products. 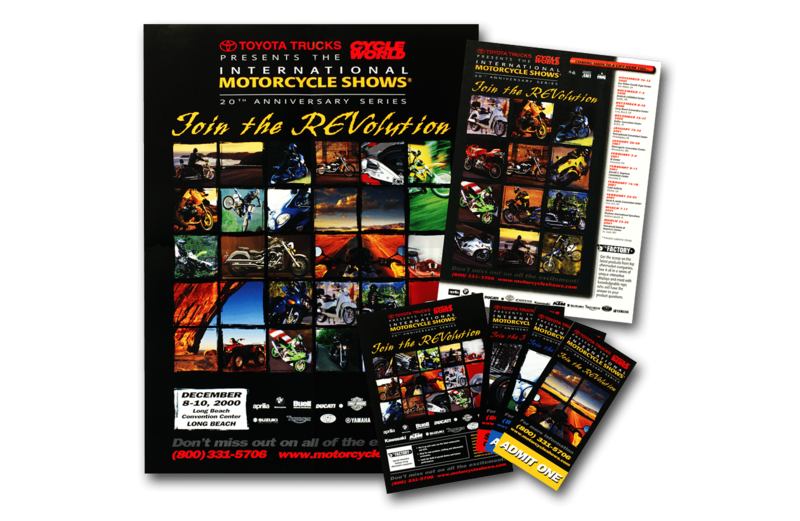 International Motorcycle Shows needed the design to be consistent across all collateral and advertising materials, including tickets and posters. Working closely with the show organizers, I developed an edgy, rough design with brushed frame edges overtop of an array of participant brand images that were uniform in size and shape. The print element of the campaign included a poster, a postcard, three types of admission tickets and five various advertisements to be placed in industry magazines. My approach to the International Motorcycle Shows event campaign not only impressed the show organizers, but also satisfied the participants’ requirement of being featured equally.